Despite Meeks's lack of a legitimate threat to his seat, the New York congressman has steadily compiled an impressive amount of campaign cash. 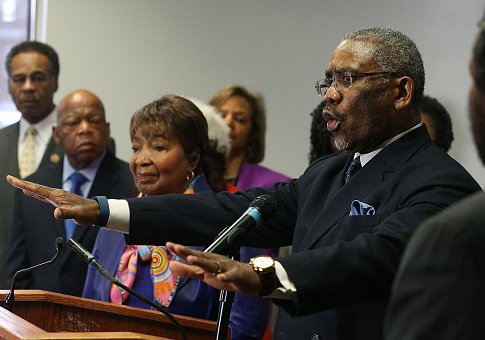 Friends for Gregory Meeks, the New York congressman's campaign committee, reported more than $1 million in contributions throughout the 2018 cycle, including $770,000 that was transferred from other committees. The remaining $253,000 was given from individual donors. While the campaign raised more than $1 million, it also reported spending more than $1 million, much of which went into the pockets of D.C. consultants, toward credit card payments, catering and site rentals for events, and legal services. The wife of Robert Simmons, Meeks's chief of staff out of his Jamaica, New York City office, was also paid tens of thousands of dollars by the campaign this past cycle. Patsy Simmons, who acts as the campaign's treasurer, typically an unpaid position, does not collect payments from the campaign directly to her name. Rather, payments are routed to Einna, Inc., a company that was incorporated in November 2008 by Simmons, according to New York business filings. Meeks's campaign made eight transfers totaling $60,000 to Einna this past cycle, filings show. Since 2010, her company has received more than $200,000 from the campaign. The Democratic congressman also spent $20,000 on vehicle bills, including monthly lease payments of $968 on a Lexus, which totaled nearly $17,000 from the beginning on 2017 to late 2018. Another $2,228.05 was put towards servicing the vehicle. The campaign disbursed $1,969.94 on auto repairs for a Mercedes-Benz. Meeks's campaign could not be reached for comment on the expenditures.